I am very enthusiastic about being able to provide you with this online resource. Since my election, I have made it my top priority to continue to be as open and accessible to the community-at-large as I can be. 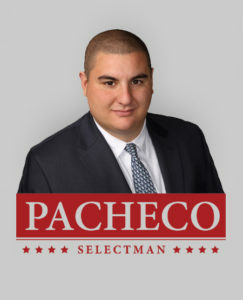 It continues to be my distinct pleasure to serve you as your selectman and I look forward to continuing to work with you to ensure Raynham stays among the most competitive, appealing places to live and work within the Commonwealth. Please take some time to review my site as I am sure you will find it a useful resource. As always, if I may be of any assistance to you, please do not hesitate to contact me through the "Contact" page above.